As promised, we continue our tour of the Southern Gentlemen’s Quarters — and today, we’re exploring the bar. If you’d like to take a moment to catch up, please explore the foyer, the dining room, and the show-stopping kitchen. Go ahead, we’ll wait for you. Alright, now that you’ve had the full tour, let’s start with the inspiration. 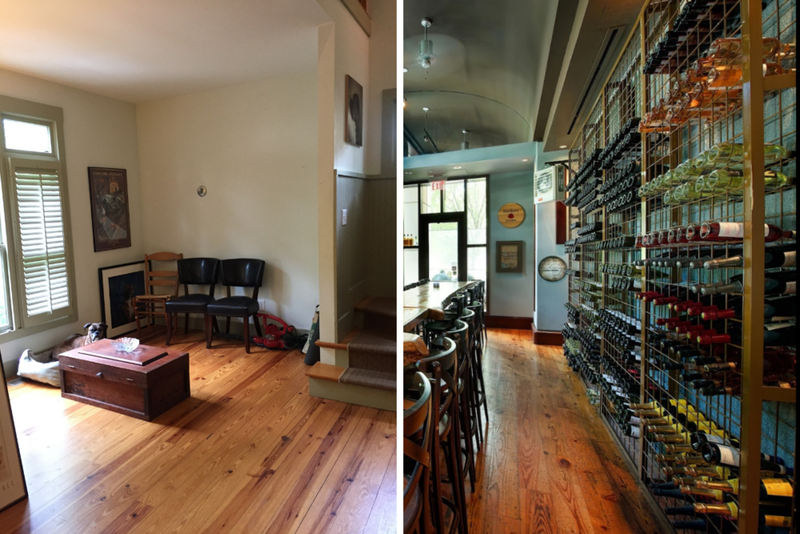 The homeowner loves the wall-to-wall wine rack at Atlanta restaurant, Local Three. My client loves to entertain, so this renovation demanded a bar area. The bar area was designed to feel like a masculine, modern speak easy. 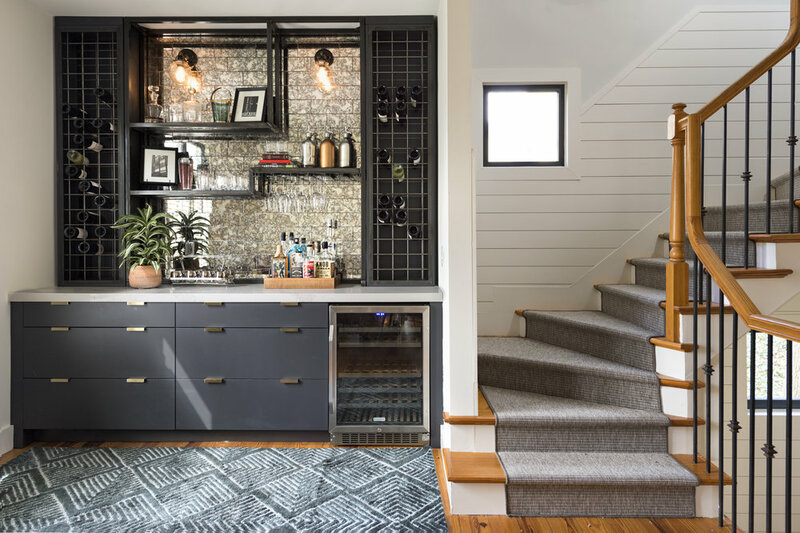 Masculine and modern, this custom bar makes entertaining a breeze. Photo Credit: Cati Teague Photography for Gina Sims Designs. The wine racks and the shelving were done by the brilliantly talented team at Fred Martin Welding in Atlanta. 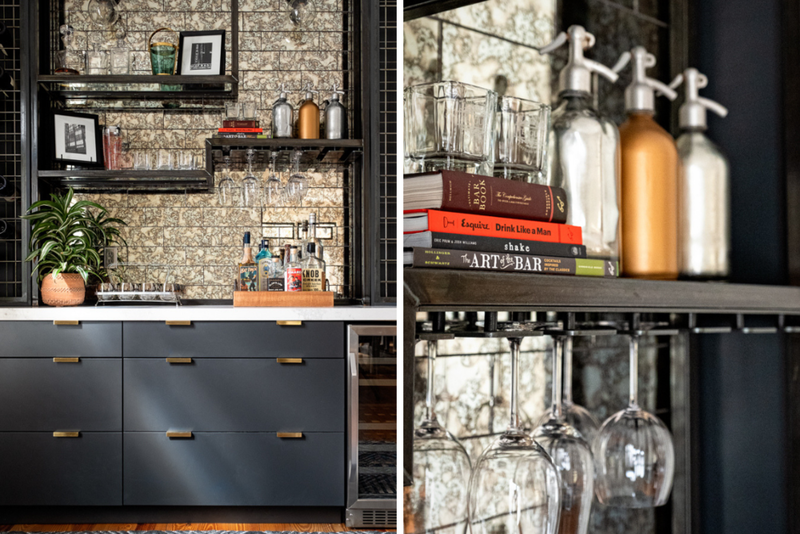 Created in raw iron, the wine rack and shelves carry the overall industrial feel of the entire kitchen area. The shelves were inspired by a shelving unit the client loved. We outfitted the frame with glass shelves so the lights could illuminate the entire bar. The custom cabinetry was done by our friends at Dove Studio. The counter height compliments our tall client, matching the height of the kitchen counters. The real star of this bar is the tile: a mirrored tile with an antique patina. It provides a smoky, sleek atmosphere in the bar area that drives that Speak Easy feel home. Raise your hand if you’re ready to be invited to a party at this house! The custom shelving features wine glass storage. Photo Credit: Cati Teague Photography for Gina Sims Designs.